Robinson walks outside Ebbets Field, the day after he broke the color barrier and became the first African-American to play in the Major Leagues. April 16, 1947. I mentioned this in one of the Dock Ellis threads: in the DE documentary there's audio of Ellis reading an encouraging letter Robinson wrote to him at the height of Dock's notoriety, around 1971, and Ellis just bursts out in sobs. 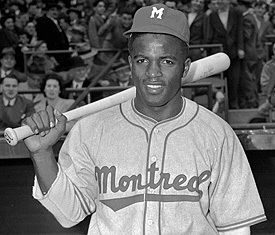 It's tremendously moving, and a hint of how much he meant to black players who were kids in the '40s and '50s. I imagine someone's done this (post a link if you know of anything): what might his career stats have been if he'd debuted at 20 or 21 instead of 28? I'd estimate 250 HR, 2,700 hits, 350 SB (when that would have been a huge total), 80 or 85 WAR. I wanted to show my class 42, but a quick check of IMBD and, as expected, lots of language. So I showed them The Jackie Robinson Story instead, which had been sitting on my shelf unwatched for many years. "N______" turns up once, much to my surprise. (I stopped the film and we talked for a minute.) Other than that, the story is watered down in the way you'd expect (but which is good for kids...or at least good for teachers if you're answerable to a principal and parents). Robinson is okay playing himself. That sounds bizarre, but that's about all you can say; he's okay. I've never heard Branch Rickey talk, but the guy who plays him doesn't look remotely like Rickey, nor does he come across in the way that I always envisioned Rickey to be. Subjective impression--I could be totally wrong. I didn't expect the bulk of the film (we've still got six minutes to go) would be pre-Dodgers. The thing that's hardest to adjust to--I asked the class if they picked up on this; amazingly, no one seemed to--is how unbelievably slow and stilted the film is. (Typically, they were more concerned about the fact that it's black and white.) It's pretty much on a level with Ed Wood in the pacing department. It eschews corny Hollywood theatrics for big dead empty spaces.